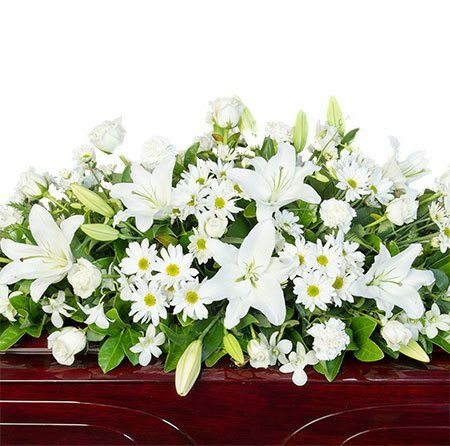 A stunning garden like funeral casket spray featuring a combination of fresh flowers including pure white oriental lilies, chrysanthemum daisies, Singapore orchids, gladioli and ivory roses. 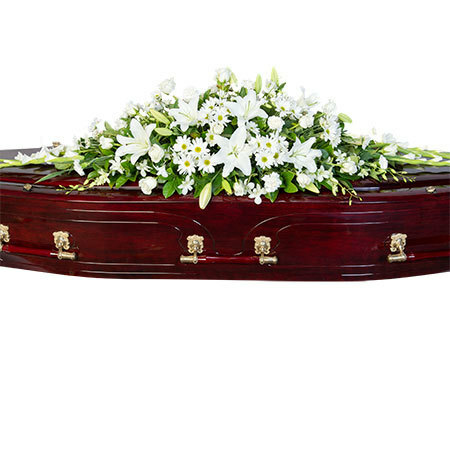 Offset by lush green foliage, this traditional funeral casket flowers can be ordered easily via our online florist shop or by phoning our friendly consultants toll free on 1800 66 66 46 or emailing sales@flowersforeveryone.com.au. Flowers for Everyone is Sydney`s premier florist, offering a highly professional floral service for funerals around the Sydney metro. Need to arrange funeral flowers outside Sydney? Our florists will coordinate your order via an affiliate florist network to recreate our design and colouring as closely as possible.